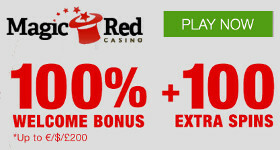 When new players join Casino Red they are invited to enjoy a bonus that will help them to get ahead. This bonus is good for 10 free spins and the best part of all is they won’t even need to deposit anything into their account in order to take advantage of this bonus. Another great thing about this bonus is the registration process is quick and easy; this means players can get right to enjoying the benefits of the bonus in no time at all. The free spins are credited to the players account once they have registered and then they can begin using them on the exciting slots game, Starburst. The winnings players receive from their free spins will need to meet a 40x rollover clearing requirement before the players will be able to cashout. The maximum amount that can be paid out from this bonus is €100. This bonus is only available to players who are new to the casino and who are located in Germany, Czech Republic, Switzerland, Austria, Poland, Ireland, Belgium, United Kingdom, New Zealand and Australia. New players want to be sure they don’t pass up the chance to take advantage of this bonus.